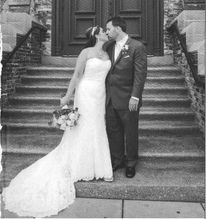 Have your wedding at St. Luke's! Large, spacious church with cathedral ceilings and stained glass windows, burnished wood pews with buffed marble floors, large double doorway for bride?s entrance and couple?s exit, sweeping stairway to the street below. What amenities do you have to offer for the ceremony? Do you have officiants that you work with? Our parish priest is available to work with couples doing the ceremony as well as required premarital counseling and rehearsal; we can also provide names of other clergy in the area who may be available; finally, couples may choose to use clergy familiar to them. Can the bride and groom have a rehearsal the night before the wedding? Will the officiant be conducting it? How many can you seat in the ceremony area? Are there any restrictions on videographers, photographers, florists, etc? Videographers and photographers are asked to be as unobtrusive as possible during the ceremony and to not use flash photography except at the entrance of the bride and the exit of the bride and groom, as well as before and after the ceremony. Florists are asked not to use adhesive materials that would leave a residue, and are asked to remove all materials and flowers after the ceremony, unless prior arrangements have been made to donate the flowers to the church. St. Luke?s has been the historic site of hundreds of weddings over the last 140 years, and is truly one of the most beautiful buildings in southeast Wisconsin . For the bride who dreams of a traditional church wedding, this is the place to be!